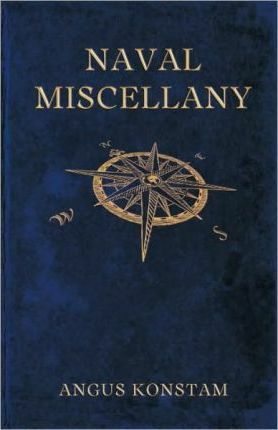 For armchair admirals, history buffs, and naval enthusiasts everywhere, "A Naval Miscellany" is an indispensible and entertaining collection of fascinating and little-known facts, anecdotes, lists, curiosities and stories from our naval past. Forgotten heroes, amazing blunders, surprising trivia, and strange-but-true stories are all included. Who were the naval heroes of the ancient world, and the world's worst admirals? How much did a midshipman get paid in the eighteenth century? What are the origins of sea shanties? Where are the biggest naval bases in the world today? And how does a ship float? It's all here in this little book that will amaze and enlighten even the most avid student of naval history! "NO FOC'SLE'S fully furnished without it. Angus Konstam's appealingly presented sampler brings together all manner of maritime lore. From the bowline to the boatswain's pipe; from the Top 10 knots to Nelson's funeral; minesweeping methods and memorable quotations; anchor design, the articles of war, acronyms of the US Navy, notable ship's mascots, figureheads and landlocked navies. Konstam has been around the Horn a fair few times as a naval historian: immense learning worn lightly, entertainingly presented, are the keynotes." --The Scotsman While many miscellanies (trivia books) are primarily a compilation of lists, Konstam opted to write fascinating articles to whet the reader's appetite. His intent was to appeal not only to naval enthusiasts, but anyone with a curiosity about naval history... What makes Naval Miscellany such a delight to read is I can pick and choose the titles that most appeal to me or skip around, rather than reading the book from beginning to end. Although a hardback, the book is the size of a paperback that contains a chest full of treasures to scintillate the mind. "Cindy Vallar, Pirates and Privateers"
Offers a sailor's collection of nautical qualities and facts about the sea, blending yarns about pirates and escapades with rowdy songs and history to make for a rollicking, fun read. Any sailor will find this an outstanding presentation, and any nautical library will also relish the variety of stories and experiences. "The Midwest Book Review"
""Offers a sailor's collection of nautical qualities and facts about the sea, blending yarns about pirates and escapades with rowdy songs and history to make for a rollicking, fun read. Any sailor will find this an outstanding presentation, and any nautical library will also relish the variety of stories and experiences." -"The Midwest Book Review""
Angus Konstam hails from the Orkney Islands, and is the author of over 50 books, 30 of which are published by Osprey. This acclaimed and_widely published author_has written several books on piracy, including The History of Pirates. His most recent work is a full-length piratical biography: Blackbeard: America's Most_Notorious Pirate.__A former naval officer and museum professional, he worked as the Curator of Weapons at the Tower of London and as the Chief Curator of the Mel Fisher Maritime Museum in Key West, Florida. He now works_as a full-time author and historian, and lives in Edinburgh, Scotland. The author lives in Edinburgh, Scotland.